This is the oldest photograph in the Museum’s collection. It is a daguerreotype, a unique image formed on a silvered copper plate. The daguerreotype was the first photographic process, publicised in January 1839. It was named after its inventor, Louis Daguerre. Just a few weeks after the French Government revealed the secrets of daguerreotypy in Paris in August 1839, Monsieur de St Croix organized the first public demonstration of the process in London. This is therefore among the very first photographs taken in London. The scene is reversed – as is characteristic of the process – and the image on the shiny surface is difficult to read. However, once caught at the correct angle, amazing detail emerges. In the foreground there is a statue of Charles I and in the distance the royal Banqueting House. There are also traces of the people who stayed still long enough to register on the exposure, which probably lasted some minutes. 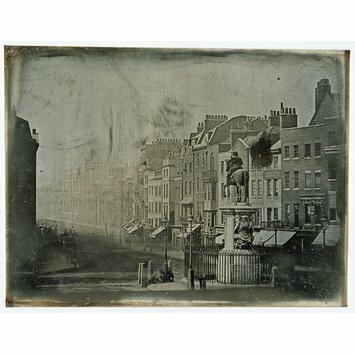 Whitehall From Trafalgar Square, daguerreotype. 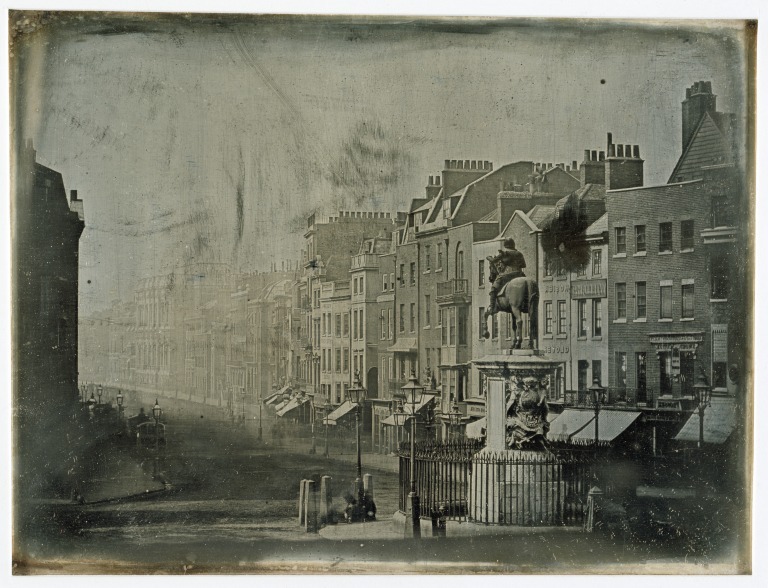 Whitehall From Trafalgar Square, daguerreotype by M. De Ste.Croix, London, Britain, 1839. V&A collection and among the first made in England.